Isn’t angry sauce a great name? You can already tell that it’s going to be a sauce with some personality. It definitely has some kick but it’s not just about the heat. Like so many Thai dishes, the sauce is the harmonious balance of sweet, salty, spicy, and cool. It perfectly complements the slightly smokey flavor of the Thai grilled shrimp. I can’t take credit for the name though since it’s the creation of Chef Jett Hurapan of Songkran Thai Grill. Last week, Chef Jett invited a group of us from the Houston Food Blogger Collective to visit his new restaurant, sample some dishes and watch a cooking demonstration in his kitchen. After the success of his first restaurant, Chef Jett decided to open a second location that focused on family-style Thai street food. It doesn’t get anymore family-style than these peel and eat Thai grilled shrimp. Chef Jett grilled up a batch for us and invited us to dig in which we were more than happy to do (messy fingers and all). He was also gracious enough to share the recipe. 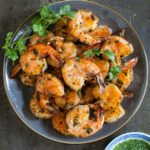 The marinade for the shrimp delivers some big flavors with just a few ingredients and a short marinating time. The smokiness of the paprika is surprisingly on point. Black sesame seeds and orange peel are two spices I don’t normally stock in my spice cabinet but I was able to find them in the bulk spice section of my grocery store which allowed me to buy just the amount I needed and not commit to full bottles. However, given how much my family enjoyed this dish, having full bottles on hand might not be a bad thing. Chef Jett uses head-on shrimp at the restaurant but head-on shrimp is surprisingly hard to find at my usual grocery stores. So, I used shrimp that had already been deveined but with the shells still on and didn’t notice any loss of flavor. Chef Jett used the grill to cook the marinaded shrimp. As you can see from the photo above, he used a high flame and doesn’t get too concerned about flare-ups. I cooked my shrimp in my wok on the stovetop with a high (but controlled) flame. With all the thunderstorms we’ve been having, I didn’t feel like dodging the rain or the mosquitos outdoors. Use which ever cooking technique you’re more comfortable with. They both yield equally delicious results. Then pass the paper towels and dig in! Note: I was invited to attend a tasting at the restaurant as a member of the Houston Food Blogger Collective. All food and drink were provided by Songkran Thai Grill. As always, all opinions are my own. Thank you for supporting the companies that help make Taming of the Spoon possible. In a large bowl, stir together oil, garlic, sesame seeds, orange peel, paprika, garlic powder, and cilantro. Add shrimp and toss mixture with your hands until shrimp are evenly coated. Let shrimp sit at room temperature 10-15 minutes to marinate. Grill shrimp in a single layer over a high flame until cooked through, 5-8 minutes, turning half-way through. Put all the sauce ingredients into a blender and blend together until cilantro is evenly chopped, about 30 seconds to 1 minute. You can also cook the shrimp on the stovetop. Heat a heavy bottom wok or skillet over high heat. Add 1 to 2 tablespoons of vegetable oil and swirl the oil to evenly coat the pan. Add half the shrimp and cook in a single layer until shrimp are cooked through, 5 to 8 minutes, turning half-way through. Wipe out pan and repeat with the remaining shrimp. Recipe adapted from Chef Jett Hurapan. So glad to hear you made the recipe and loved it. It makes my heart happy. Thank you so much for coming back to leave a comment. That raw kale asian salad sounds awesome! !